Over the weekend, contractors added the name of Sergeant Eric M. Houck, formerly of Perry Hall, to the Baltimore County memorial commemorating those who have died in the Persian Gulf. The Department of Defense announced in June that Sgt. 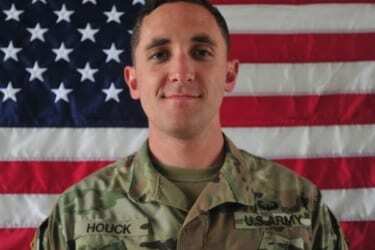 Houck, 25, had died while supporting Operation Freedom’s Sentinel. Two other soldiers were also killed. The men died on Saturday, June 10, 2017, in Peka Valley, Nangarhar Province, Afghanistan, of gunshot wounds sustained in Peka Valley, Nangarhar Province, Afghanistan. The Taliban has claimed responsibility for the attack. The other two men killed were Sgt. William M. Bays, 29 of Barstow, California; and Corporal Dillon C. Baldridge, 22 of Youngsville, North Carolina. The Persian Gulf Veterans Memorial was completed in November 2016 and is located on the grounds of the Baltimore County Historic Courthouse near Pennsylvania Avenue in Towson. 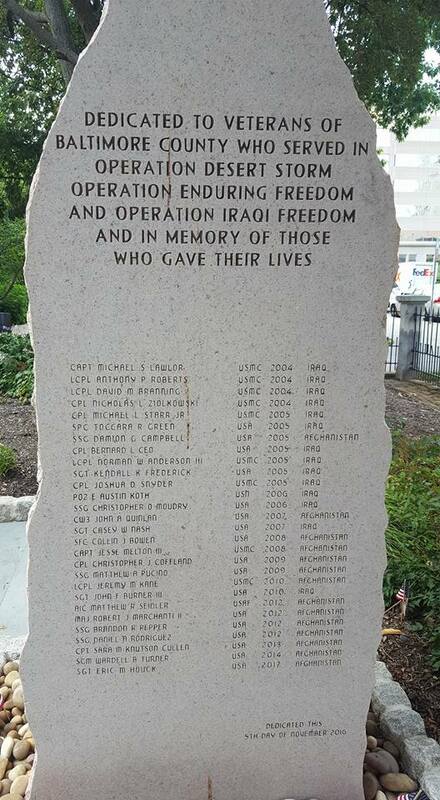 The memorial honors those Baltimore County residents who served in Operation Desert Storm, Operation Enduring Freedom, and Operation Iraqi Freedom.